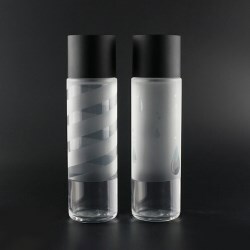 A new decoration option is available in COPCO's primary package family, -- Half Matte finish.-- We are able to make a PET bottle partially covered by matte finish. This technology has been ready for mass production after investigation and experiments for a long time. Features: 1. A clear and straight dividing line between matte and glossy area. 2. Glossy content on matte surface workable. Different looks of foam pump in neck size 40/410 for your choice! As a professional supplier of cosmetic packages, COPCO is always exploring new package types and decoration possibilities. This week we are launching a brand-new decoration, the holographic coating, which adds a iridescent sheen on bottle and makes your product standing out on the shelf instantly. We can make this finish on PET and ABS packages. Further decorations such as silk screen print and hot stamping can be added on this finish. 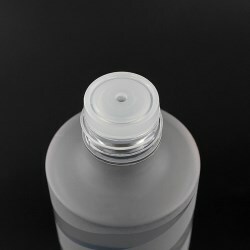 The classical foaming bottle design is made for hand wash, with 2 sizes available 300ml and 500ml, neck size 40/410. Instead of regular inner spring mechanism, the foam pump features an outer spring to make sure product dispensing with a metal-free pathway. Its output is 0.8cc, and can be made with larger output according to specific request. COPCO's acrylic jar comes in 3 sizes from 15g, 30g to 50g and is great for eye cream, facial moisturizer and other skincare cream and gel. Outer jar made of acrylic which offers diversified decoration options, inner jar is made of PP material, which has great compatibility with various skincare formulations. The cap is ergonomically designed for an easy and pleasant hold, and also makes the jar looks more sophisticated. If you are worried about product been opened accidentally during transportation, clip lock pump would be a better option than left-right locks. With a clip lock, products will be shipped securely. COPCO presents a series of cylinder foaming bottles, sizes from 100ml, 150ml, 180ml and 200ml. Neck size 43/410, with a foam pump and a overcap. Other than a regular foam pump with inner spring mechanism, we have also an outer spring for those products which do not supposed to contact metal. Colors and decoration options: 1) Bottle, pump and cap can be colored by injection molding, any PMS color or according to your color sample. 2) Bottle can be sprayed to gradient color or matte finish. Silk screen printing and hot stamping services are available. 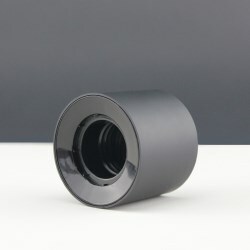 3) Cap can be sprayed to matte finish. 4) Closure of pump can be metallized into gold or silver. A hot stamped band around the closure rim is available if requested. The glass roll-on vial is a great choice for pocket perfume, or perfume trial packs and testers. There're a wide range of sizes available from 3ml to 30ml. Various color and decoration options are offered. COPCO is launching a collection of HDPE bottles, which are perfect for personal care items such as shampoo, body wash, conditioner and body lotion etc. It's available in 3 sizes, 125ml, 250ml and 500ml. A new member is joining COPCO's foaming bottle family, -- HDPE foaming bottles. While PET is quite strong to perform well in compatibility tests with all kinds of formulation, HDPE is more acid resistant. It would be a better choice for products contains acid such as AHA. Neck size 43/410. 2 sizes available 150ml and 160ml. Feel free to let us know if you need other sizes or shapes. Our sales representatives will make prompt proposal according to your specific needs. COPCO is launching a series of large Airless bottle in PP material, sizes available in 150ml, 200ml and 250ml. They are great choices for body lotion, hair products and SPA / salon products. We can color the bottle and pump as you want. Metallization color on collar and printing service on bottle are also available. COPCO launches a series of mini-packs for perfume samplers and promotion programs. These glass vials are available in sizes from 1ml to 15ml, with multiple dispensing systems to work with different formulas. Application: Perfume sampler, perfume tester, and pocket perfume etc. Sizes available: 80ml to 230ml Dispenser options: Serum pump, lotion pump, mist spray pump and caps etc Decoration options: 1) Injection molded colors including clear, translucent, opaque and pearlized; 2) Inmold high-gloss colors; 3) Gradient color spray; 4) Holographic finish (Iridescent color); 5) Silk screen print and hot stamping. Benefiting from the multiple sizes and decoration options, this collection of PET bottles are versatile to realize all kinds of applications in personal care field. Sizes available: 100ml to 300ml Dispenser options: Serum pump, lotion pump, mist spray pump and caps etc Decoration options: 1) Injection molded colors including clear, translucent, opaque and pearlized; 2) Inmold high-gloss colors; 3) Gradient color spray; 4) Holographic finish (Iridescent color); 5) Silk screen print and hot stamping. COPCO attended Cosmopak Asia Hong Kong in the middle of November. 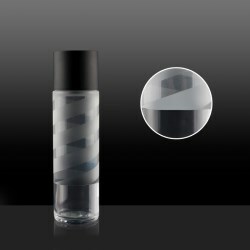 Gradient color bottle is one of the most popular items in the show. We can customize gradient color in your desired color, shade and transparency. Various decoration options are available, 1) Transparency level; 2) Both single color gradient and dual-color gradient are workable; 3) We can further silk screen print and hot stamping on bottle. Metallization of plastic packages is usually appeared in solid color, such as solid gold / silver. COPCO is going to launch a new option, which is sheer metallization. It's realized by nano coating material which forms a very thin layer of coating on the surface, so that you can see through it. 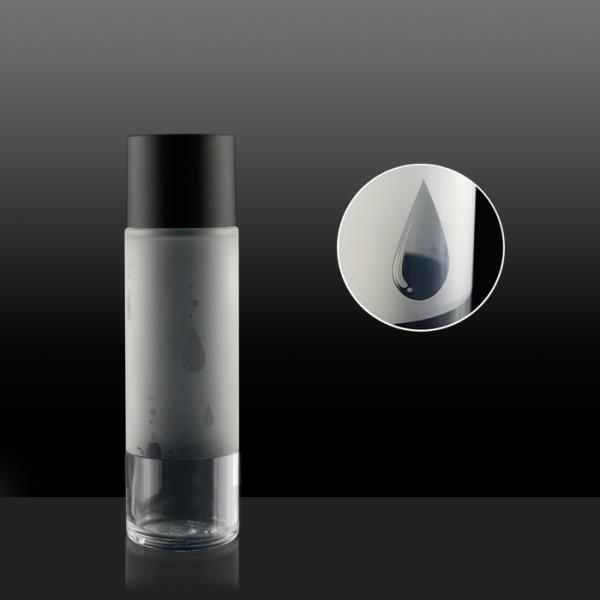 Another feature of sheer metallization is its perfect mirror surface which makes the bottle looks premium and high-end. By the way, we are able to make trendy holographic hot stamping on the bottle. Crystal clear bottle in square shape, silver shoulder and pump, with a square cap to complete the image, -- this is COPCO's new product this week. Together with acrylic jars in same shape, this collection is a great choice for premium skincare lines. Bottles are available in sizes 15ml, 30ml and 50ml. Jars are from 5g, 10g, 15g to 30g and 50g. Diversified decoration options are provided, such as silk screen print, hot stamping and a matte finish to bottle, jar and cap. COPCO has launched a series of plastic sampling bottles for skincare products. Sizes are available from 5ml to 20ml. Other than regular cylinder shape, an oval shape is also offered. They are applicable for products in thin texture such as toner and lotion. COPCO's tubular glass bottles are available in different capacity from 1ml to 30ml, The entire collection match with different dispensers, plugs, mist sprayers, screw caps, roll-on applicators, and droppers. COPCO China introduces an improved lotion pump design with dispensing spout that can be turned 360 degrees clockwise while locked. The result benefits contract filling manufacturers to easier and more convenient turn dispensing spout facing up front along with bottle front cover properly.